Gallic Gesamtkunst it may be, but Debussy Pelléas et Mélisande channels Wagner sans bombast. 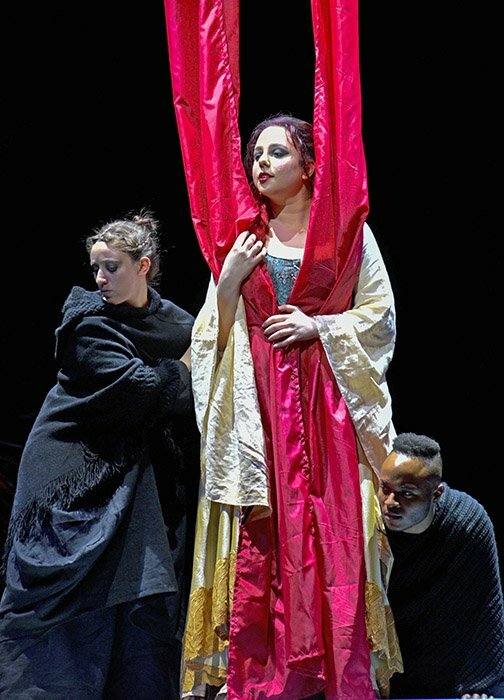 Last weekend’s clarifying BU Opera Institute production at the Majestic dispensed with the gallimaufry of framing a timeless fairytale in a naturalistic stage picture box while accompanying it with emphatically advanced if highly agreeable music (the initial 14-performance run made money). Aside from an incestuous kiss and a successful murder, so little happens in this most interior of operas that one hardly missed verisimilitudinous depictions of forests, caves, towers, fountains, bedrooms, and maybe a wolf glen for good measure. In Maurice Maeterlinck’s Symbolist play, Debussy (as well as Faure, Schoenberg and Sibelius) found a suitably vague dreamy and steamy property. If you think you get Symbolism, you’ve gotten it. It’s the Id writ literary. Paul Dufresne’s shimmeringly bland yet stage-filling scena supported Debussy’s drenched and diaphanously narcotic fragrance through the agency of three elements only: broad, glittering narrow-drop curtains, bambooish battens, and movable platforms. Stagehands transported the elements with such methodical smoothness that the 13 scene changes never jarred as they would have with the naturalistic grand opera shape-shifting the Opera-Comique audiences would have witnessed at the premiere, in 1902. And the paucity of textural references in the abstracted staging allowed Debussy’s world-beating word painting to speak for itself. Without observing Mark Pearson’s handsomely detailed medieval costumes, we would have been unable to ground the proceedings in any period other than that of Mylar. E. Loren Meeker encouraged the performers to move with stateliness, and to direct their vocal effusions to one another rather than barking to the back rows. The quiet impersonations brought Method intensity to the exponents of Maeterlinck’s loaded prose. Meeker always had something moving onstage, whether drops or figures. Dark-clad attendants carried out non-urgent business and scenic elements moved nobly. Marcella Barbeau enlivened the abiding noir with helpful follow-spots and lighting instruments strangely placed behind the gadrooned black backdrop. Other than the costumes, color came only from the glittering blue Mylar stars dusted down throughout the Grotto Scene and in the bright red entangling ribands of hair, again descending from the proscenium arch in Mélisande’s Rapunzel moment (Act III, Scene 1). Thirty musicians in the Majestic pit played from Stephen McNeff’s considerate reduction, which preserved Debussy’s timbres without ever betraying the requirements of satisfying climaxes, although one missed sumptuous shimmers of divisi strings. William Lumpkin led the company through almost three hours of one of the subtlest scores in the rep with nary a hiccup. His consideration of singers allowed them chansonesque expression in exposing their souls while ensuring that Debussy’s tones admonished, foreshadowed and glistened with ripe explicitness. Under his leadership the players contributed lofty conversation. Kudos to the Boston University Chamber Orchestra for transcending its weight class. One imagines that in our age of virtuosity at conservatories, this was accomplished with fewer than the 15 weeks of rehearsal required before the premiere. 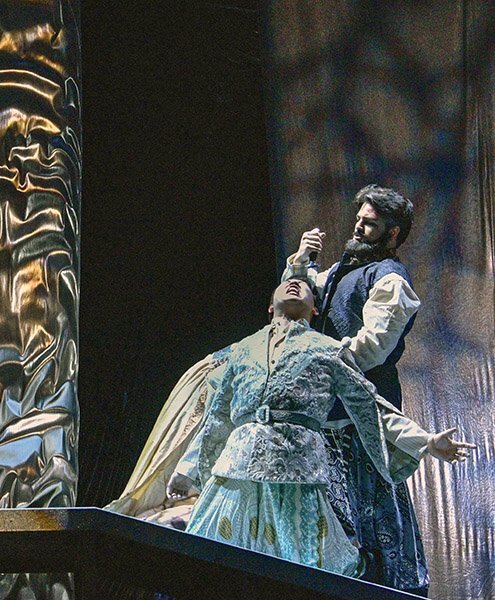 All of the singers showed complete comfort with Debussy’s lyricized prose, but in scene after scene Fernando Cisneros as Golaud commanded with a tremendously strong and dramatic presence. His bona fide money voice ranged from Wotanish outbursts to sotto voce intimations, always in support of the role and wedded to the context of ensemble. One felt the entirety of his pain when he sang, “My chest felt as if the whole forest had fallen upon me” (it sounds better in French). Soprano Jennifer Jaroslavsky portrayed the anguish, the ambivalence, and the longings of Mélisande in tireless true tones. 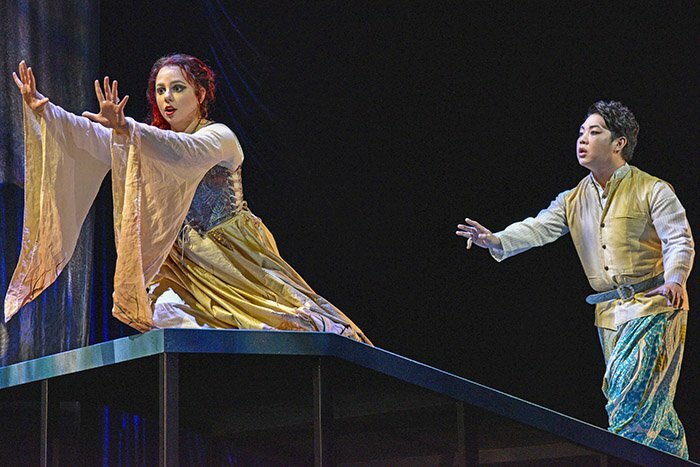 As the would-be lover arrested in his development, tenor Heeseung Chee projected a refined and even sound which at climactic moments truly engaged. Playing an old man may be a challenge to many singers in their 20s, but not to basso Isaac Kim, who depicted King Arkel with believably bent gait and weary mien. His prodigious bass came across with a bit of a wobble, though, as if trying a bit too hard to convey senescence. His #MeToo feasting on the young lips of the pregnant Mélisande after having banished death from the château made us wince. One should be wary of casting Zaray Rodrigues in a supporting role; when as Geneviève she recited the letter from her son Golaud, her notable steadfast vocal production entranced us. In the peeping Yniold scene, Emilie Faiella gave appropriately youthful voice to the short-trouser role while describing that most lusciously and grotesquely sensual encounter (even with the censored references to a nuptial bed unrestored). Could Yniold have been the infant Iago? Jealousy, rage, birth, death, and longing surge and torment in the Otello-reminiscent closing scene. This time, the boss got away with murder. Mark DeVoto adds some thoughts about the score. This would have been the fifth time I attended a live performance of Pelléas et Mélisande. I was present at Ernest Ansermet’s Metropolitan Opera debut with it, in 1962, and at the New England Conservatory’s performance at the Loeb Drama Center when Gunther Schuller conducted it, in February 1969; this latter performance included a restoration of the 16 bars deleted from act III scene 4 at the order of the Paris censor, who declared the reference to Mélisande’s bed too suggestive. (If you look on page 244 of the Dover reprint of the full score, you’ll see that rehearsal number 65 is missing.) At that performance, Debussy’s complete autograph piano-vocal score of the opera, then owned by NEC, was exhibited under glass in the foyer. (NEC later sold it, alas.) More recently I heard the concert performance by the BSO directed by James Levine, and a staged performance in Montreal in March 2012, which I discussed in these pages. There are a number of good recordings, too: I first learned the opera from the 1944 wartime take conducted by Roger Désormière, and later from the still-exquisite recording with Victoria de los Angeles and Gérard Souzay and directed by André Cluytens. There are videos available today that I wouldn’t recommend, including one in which act III scene 1 takes place on the roof of a late-model Detroit car half-buried in Styrofoam snow, which took modern symbolistic interpretation to unseemly lengths. That scene in fact represents a critical point in the whole opera, where Pelléas and Mélisande are on a tutoyer basis for the first time and where, in the crucial orchestral interlude that follows, it becomes plain to the audience that they love each other even though they have not yet declared it to themselves. The evidence is at bar 247, rehearsal number 24, with key signature of D-sharp minor (six sharps); Mélisande’s theme in the solo oboe combines with Pelléas’s in the solo cello, forming the top two voices of the Tristan chord at its original absolute-pitch level. This isn’t the only place in Pelléas et Mélisande where the chord appears, but here it is explicitly emblematic — explicit and perfectly understated, as is typical of Debussy. Debussy’s own growth is unthinkable without Wagner, yet Debussy’s Wagnerianism is always perfectly assimilated even from his earliest maturity, as in the Five Baudelaire Poems, of 1887, and La Damoiselle élue, of 1889. By 1899 Debussy could dismiss a friend’s suggestion that he prepare a suite of extracts from the as yet unorchestrated Pelléas et Mélisande for concert use, much as Gabriel Fauré had done for his own incidental music for London performances of the same play. In a snide reference to Wagner, Debussy said that he didn’t want to be like the fellow who couldn’t afford to pay for contrabass tubas. Thoughtful reviews and good commentary from Mr DeVoto – but weren’t the (amazing) BSO concert performances led by Bernard Haitink, not James Levine? I think the reduced orchestration for a chamber ensemble may have been used in part because there would not have been space in the Cutler Majestic pit for the full orchestra. Whatever the reason, under William Lumpkin they played well and that orchestration maintains Debussy’s soundscape very well. I agree that Fernando Cisneros stood out in a sea of very good singers. A very good performance all around by BU Opera Institute.